This unusual and wind bent tree is on the shores of Glendalough in County Wicklow. When I need a break from the flat land of Kildare I travel a few miles east to this mountainous part of Ireland. Glendalough is a popular tourist location and a must-see for overseas visitors. Apart from the spectacular scenery, the remains of the monastic settlement (founded by St. Kevin in the 6th century) give an idea of the importance of this ‘Monastic City’ 1500 years ago. The colours I used when I started this painting were Yellow Ochre, Burnt Sienna and Cobalt Blue, similar to the last painting. However as I began to paint in the foreground, I couldn’t get the richness and depth of colour needed. The 3 colours produce beautiful harmonious colours and are great when suggesting a landscape running into the distance. Trying to overpaint a foreground, as in the line of trees, in the same limited range of colour is going to cause problems. I use Olive Green as it is rich and dark and a similar shade of green as that produced by Yellow Ochre and Cobalt. Even as a neat unmixed colour it has a natural green colour. I am using fine ‘liner brushes’ (used by sign writers) at the moment to help with the really fine lines of branches and grasses. I tried Liquin Fine Line and didn’t find it great for my application. My technique is to thin the paint with solvent only, to the consistency of ink. More fluid than the wet paint onto which I’m painting. If its not this thin, the brush will pick up paint rather than put it down. Draw the lines with a flicking action, rotating the brush. It takes a bit of practice, but its worth the effort. 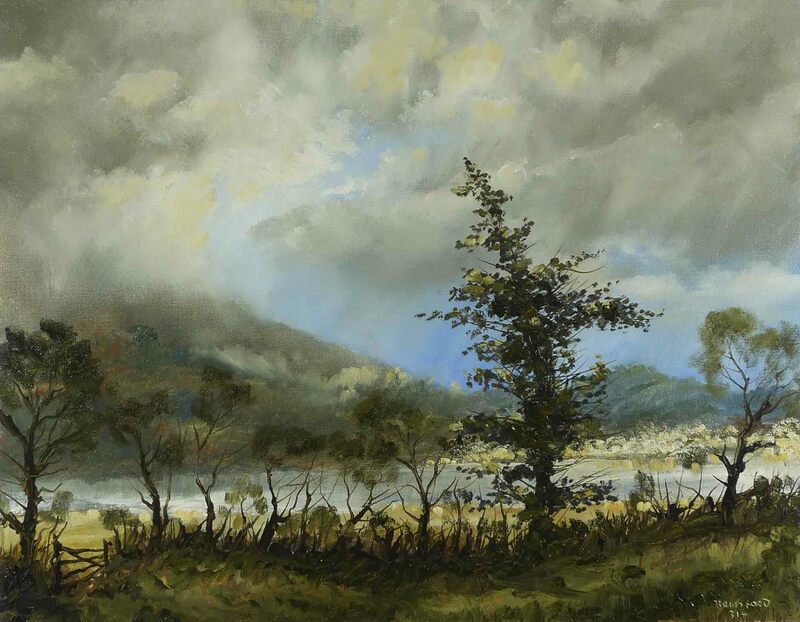 This entry was posted in Oil Painting and tagged Art, Clouds, demonstration, Instruction, landscape, Oil Painting, painting, Sky, Trees. Bookmark the permalink. Probably the most scenic place in the country. Spent 1 1/5 days there two weeks ago! True and I’m so lucky to live nearby.